This observation of the Nili Fossae region (FRT00003E12) was acquired by CRISM on January 13, 2007, and shows a variety of rock types including basaltic rock in gray, igneous rock rich in the mineral olivine in magenta, clay-rich rock in blue-gray, and small carbonate-rich outcrops in green. All of the advanced processing steps have been applied to this image to remove effects of the atmosphere and instrument artifacts. The hour-glass shape of the image results from the changing range to the target point on Mars' surface as the image was taken over nearly 3 minutes. Since it began operations in 2006, the Compact Reconnaissance Imaging Spectrometer for Mars (CRISM) instrument on board NASA’s Mars Reconnaissance Orbiter (MRO) has contributed to some of the most important findings about the past and present climate of the Red Planet. To do that, CRISM has acquired tens of thousands of targeted observations that each sample hundreds of visible and near-infrared wavelengths needed to map the wide range of minerals now known to occur on Mars. 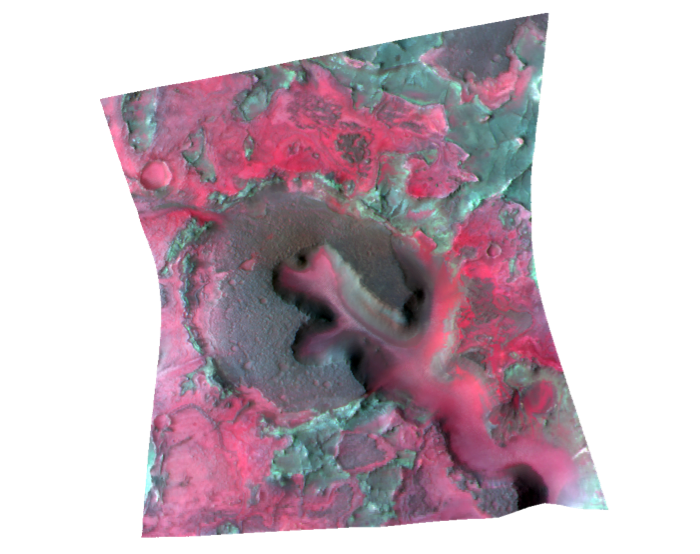 CRISM’s targeted, high-resolution, hyperspectral data allow scientists to investigate Mars’ surface mineralogy at an unprecedented spatial scale of 20 meters (66 feet) per pixel. However, use of the data by the scientific community to study the Martian surface has been complicated by several factors. These include instrument artifacts, the combined effects of the surface and atmosphere on the observed signal, the highly variable geometry that CRISM uses to track the surface as it flies over each observation site, and the inherent complexity of working with image cubes that have hundreds of wavelengths. As a result, users of the data set have needed a detailed understanding of the instrument in order to extract information about Martian surface composition. The Targeted Empirical Record (TER) product suite contains fully corrected data in the instrument perspective, and the Map-projected Targeted Reduced Data Record (MTRDR) suite consists of corresponding map projected products. Both product sets standardize CRISM targeted observations to what they would be if each scene were viewed with an idealized instrument, without atmospheric gases, at a single viewing geometry as close as possible to nadir. The MTRDR data are map projected onto the best currently available global topographic map of Mars, while the TER data can be map projected using higher resolution local or regional topographic information. A key component of the new data product suites is the mineral indicator images, which the team terms “summary products.” These images can be viewed as “scores” of the strength of the spectral fingerprints used to identify minerals of interest. The calculations to produce the summary products were recently refined and expanded to better capture the mineral diversity discovered by scientists analyzing CRISM data. The update was spearheaded by CRISM team member Christina Viviano-Beck of APL. “CRISM has found such an unexpectedly diverse set of minerals formed in different environments on Mars that we had to redevelop our strategy for representing them compactly,” said Viviano-Beck. APL built and operates CRISM, one of six instruments on MRO. JPL, a division of the California Institute of Technology in Pasadena, manages the MRO project and the Mars Exploration Program for the NASA Science Mission Directorate in Washington. For more about CRISM, see http://crism.jhuapl.edu. For more about the Mars Reconnaissance Orbiter, visit http://www.nasa.gov/mro.